The ‎Lagos State University (LASU) says its admissions merit list for the 2016/2017 academic session will be released in the next few days by the Joint Admission Matriculation Board (JAMB). Mr Adekoya Martins, Acting Head, LASU’s Centre for Information, Press and Public Relations, confirmed the development to the News Agency of Nigeria (NAN) on Monday in Lagos.Martins told NAN that the number of students to be offered admission on the merit list could not be ascertained by the university because it was being handled by JAMB. 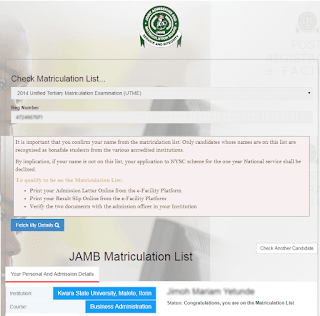 “Information reaching me from the admission office is that JAMB will release the merit list this week, but the number of the admitted students is undisclosed. “We cannot actually determine the number of students that JAMB will approve for us in the first batch from the list that was ‎sent to the board by the university,’’ he said. According to him, the screening form for the second list will be out as soon as the merit list candidates are released. ‎NAN reports that LASU had adopted an online screening approach for‎ the admission of candidates for the 2016/2017 academic session. The institution’s Vice-Chancellor, Prof. Olanrewaju Fagbohun, told NAN that only candidates who chose LASU would be screened online. “The university will go online and shortlist the credentials of successful candidates, who chose LASU as their first choice for onward transmission to JAMB,’’ he said.